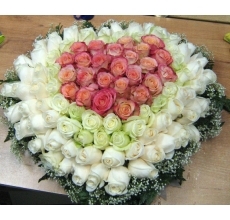 An outstanding heart-shaped arrangement on a floral foam. Pink, green and white roses with gypsophila and greenery. You can change the colour of roses while filling out the order form - please note it in the "Additional information"